This Used factory-original Glock Replacement Magazine is made specifically for the Glock 37 chambered in .45 GAP. Magazine is manufactured by Glock using the same specs and materials found in all of their OEM mags. Pre-tested but in excellent condition and will perform flawlessly without jams or other hiccups. Magazine is backwards compatible and will work with all previous generation Glock 37 pistols. 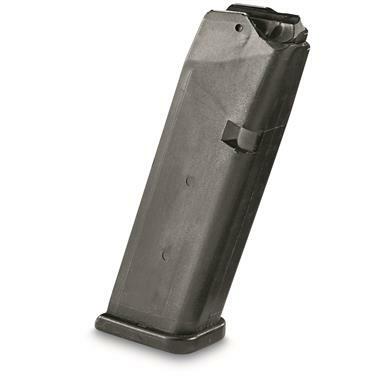 Glock 37, .45 GAP Magazine, 10 Rounds, Used, Factory Original is rated 5.0 out of 5 by 6. Rated 5 out of 5 by Toby from Great price, worked perfectly. I just used these at the range in my hand gun. They worked fine. I believe everyone should have at least 4 magazines per hand gun. I rest my magazines. I have Glock magazine's that are 15 yrs old and work fine. These are a great value. I preload my magazines prior to going to a range. No issues at all. Rated 5 out of 5 by Orlando from Mags show little wear but work excellent,no complains or fails..